Bradford is rightly famous for it’s Asian restaurants. There are some very, very good places, ranging from the ambitious restaurant groups like the Aagrah or the Mumtaz, right through to tiny back street cafes. Some are outstanding, cooking exceptional food, but – whisper this very quietly – some are terrible, serving little more than vaguely Asian flavoured slop to less than discerning customers. The last curry I had in Bradford, at one of the more famous cafe style places was just like this. It was a huge disappointment, especially compared to what it used to be like, but then again, reality rarely measures up to memory, does it? You can’t let one bad meal get you down, so we decided to try to find somewhere better, and (cheers loudly) we found it. 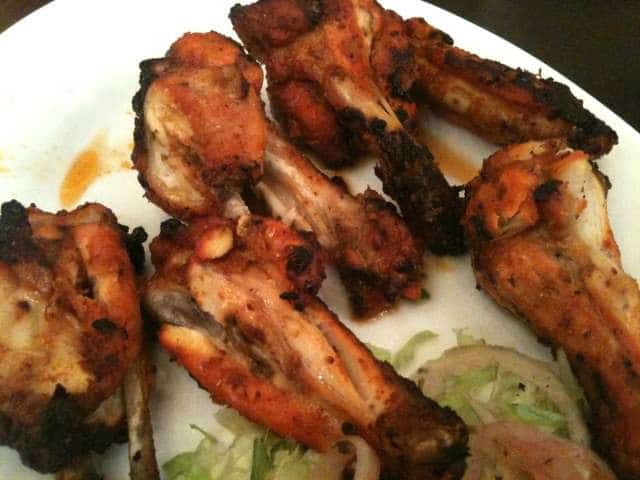 The Shimla Kebab House is just on the edge of the university campus, which guarantees a steady stream of customers into the takeaway next door, and a generally busy feel about the cafe style restaurant. Shimla’s real strength is it’s grill. There’s a long list of barbecued food such as chicken, lamb and the like, and it’s this part of their menu that’s really worth a try. Marinated, barbecued meat is normally a winner, but Shimla seem to have the knack of getting it just right. Just the right seasoning, just the right level of charring. They have a little trick involving mixing a ridiculously hot chilli sauce with a mild and creamy garlic mayonaise for use as a dipping sauce. The combination is simple, but like many simple recipes, the result is far more than the sum of its parts. All the usual curries are there, and done very well. My mixed meat masalla – chicken and lamb in a rich and concentrated sauce was very good, and served with a piping hot naan – but again, the star of the show seems to be the grill and the build-it-yourself doner kebabs. Grilled chicken, more of that chilli sauce, a little of the mayonaisse, some salad because you have to try to pretend to eat healthily, all wrapped up in a huge piece of naan bread, like a massive Asian tortilla. Overall, Shimla is very good. Good cooking, good food, good service and good value. A spot-on Bradford curry house with a far more interesting menu than most. Agreed, a very nice review and I appreciate your candor! Ooo this sounds lovely. Great review. Its all about the chicken donner at Shimlas, it really is. There is something magical about the lightly spiced chicken pieces, that glorious garlic mayo along with the chilli sauce all wrapped up in the fluffy naan. I have been making the 1hr round trip to there from Leeds for years now and it has always been worth the drive. Also, if your after something just as good and a break from the norm, check out the masala fish in naan from Leeds Road Fisheries. Another solid establishment that I have been visiting for years. Freshly fried pieces of fish coated in a lightly spicy batter, served in a naan with salad and a mix of mayo, chilli and mint sauce. Always goes down a treat with a portion of chunky chips!